Well, until yesterday, I thought spring was in the air! The daffodils are blooming, the trees have buds and the hosta is coming up in the yard. However, snow on april 15th is not my idea of spring....... I think Mother Nature has gone a little bi-polar on us this year. I am looking forward to some warmer weather and being able to be outside without freezing to death. And Jan swares she put her snowflake away, I think she hid it somewhere so it would keep working. I hated the snow days that I couldn't be here at the shop, but I think it was great for everyone who wanted to sew! 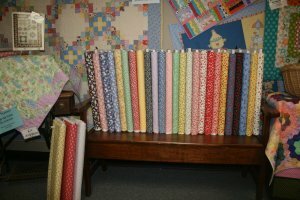 As a result, we have been busy, busy quilting for everyone. You guys have really gotten some beautiful quilts done this winter! Arrival of Spring means Quilt Market and this year it is in Pittsburgh in May. I'm excited to be going with Mom as usually I have to stay and run the shop when she goes to Houston in the fall. Looking forward to seeing new products and finding new, fun ideas! Here's what is coming up! 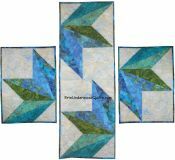 A fun spring quilt that reminds me of summer pinwheels!